The personal, or visiting, card is the representative of the individual whose name it bears. It goes where he himself would be entitled to appear, and in his absence it is equivalent to his presence. It is his “double,” delegated to fill all social spaces which his variously-occupied life would otherwise compel him to leave vacant. Since the card is to be received as the equivalent of one’s self, it is important that it shall be discreetly sent upon its embassy. In every case where personal cards are correctly used the owner is accredited with having performed de facto whatever the card expresses for him, be it a “call,” a “regret,” a “congratulation,” an “apology,” an “introduction,” a “farewell-taking,” or whatever. A card sent at a wrong time suggests the possibility that the owner might blunder similarly in his personal appearing. The neglect to send a card at a proper time is equivalent to a personal neglect. The man who comes himself and hands you his card also is apt to have too many elbows at a dinner, too many feet at a ball. He has about him a suggestion of awkward superfluousness that is subtly consistent with his duplicate announcement of himself. A man’s card is smaller, and narrower proportionately; and is of slightly heavier card-board. If the surname is short, the full name may be engraved. If the names are long, and the space does not admit of their full extension, the initials of given names may be used. The former style is preferred, when practicable. In the absence of any special title properly accompanying the name–as “Rev.,” “Dr.,” “Col.,” etc.,–“Mr.” is always prefixed. Good form requires this on an engraved card. If in any emergency a man writes his own name on a card he does not prefix “Mr.” The rule should be, to omit from visiting-cards all titles that signify transient offices, or occupations not related to social life; using such titles only as indicate a rank or profession that is for life; and which has become a part of the man’s identity, or which is distinctly allied to his social conditions. To illustrate:–The rank of an officer in the army or the navy should be indicated by title on his card, his connection with the service being for life, and a part of his identity. Officers on the retired list, and veteran officers of the late war who rose from the volunteer ranks, retain their titles by courtesy. The official cards of political officers and ambassadors, which bear the title and office of the man–with or without his name–should be used only on official or State occasions, and during the term of office. In strictly social life, the personal card of the ex-Governor is like that of any other private citizen, subject to the same rules. Similarly, professional or business cards that bear ever so slight an advertisement of occupations are not allowable for social purposes.The three “learned” professions, theology, medicine, and law, are equally “for life.” But the occupation of the lawyer is distinctly related to business matters, and not at all to social affairs. His title, or sub-title, Esquire, is properly ignored on his visiting-card, and socially he is simply “Mr. John Livingstone.” On the other hand, the callings of the clergyman and the physician respectively, are closely allied to the social side of life, closely identified with the man himself. Therefore “Rev.,” or “Dr.” may with propriety be considered as forming an inseparable compound with the name. “Office hours” are not announced on a physician’s social card. A man’s address may be engraved beneath his name at the lower right corner, the street and number only if in a city, or the name of a country-seat if out of town; as, “The Leasowes.” Bachelors who belong to a club may add the club address in the lower left corner; or, if they live altogether at the club, this address occupies the lower right corner. An engraved address implies some permanency of location. Those who are liable to frequent changes of address would better omit this addition to the visiting-card, writing the address in any emergency that requires it. No messages are written on a man’s card, and no penciling is allowed, except as above, to give (or correct) the address, or in the case of “P. p. c.” cards, sent by post. A woman’s name should never appear on a visiting-card without either “Mrs.” or “Miss” prefixed. The exception would be in the case of women who have regularly graduated in theology or medicine. Such are entitled, like their brothers, to prefix “Rev.” or “Dr.” to their names. A married woman’s card is engraved with her husband’s name, with the prefix “Mrs.” No matter how “titled” the husband may be, his titles do not appear on his wife’s visiting-card. The wife of the President is not “Mrs. President Harrison,” but “Mrs. Benjamin Harrison.” She is the wife of the man, not the wife of his office or his rank. A widow may, if she prefers, retain the card engraved during her husband’s lifetime, unless by so doing she confuses her identity with that of some other “Mrs. John Brown,” whose husband is still living. It is more strictly correct for a widow to resume her own given name, and to have her card engraved “Mrs. Mary Brown,” or, if she chooses to indicate her own patronymic, “Mrs. Mary Dexter Brown.” An unmarried woman’s card is engraved with her full name, or the initials of given names, as she prefers, but always with the prefix “Miss” (unless one of the professional titles referred to takes its place). 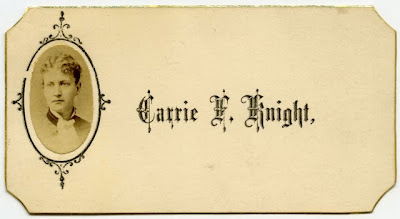 The address may be engraved or written in the lower right corner.If a society woman has a particular day for receiving calls, that fact is announced in the lower left corner. If this is engraved, it is understood to be a fixed custom; if written, it may be a transient arrangement. If a weekly “at home” day is observed, the name of the day is engraved, as “Tuesdays.” This means that during “calling hours” on any Tuesday the hostess will be found at home. If hours are limited, that is also indicated, as “from 4 to 6.” Further limitations may be specified, as “Tuesdays in February,” “Tuesdays until Lent,” “Tuesdays after October,” etc. Any definite idea of time may be given to meet the facts, the wording being made as terse as possible. If the regular “at home” day is Tuesday (unlimited), and the card is so engraved, any of the special limitations may be penciled in to meet special conditions. Sometimes an informal invitation is thus conveyed; as, by the addition, “Tea, 4 to 6,” etc. Other penciling.–Cards left or sent, before leaving town, have “P. p. c.”–(Pour prendrè congé)–penciled in the lower left corner. A holiday, a birthday, a wedding anniversary, or other event in a friend’s life may be remembered by sending a card, upon which is penciled “Greeting,” “Congratulations,” “Best wishes,” or some similar expression. 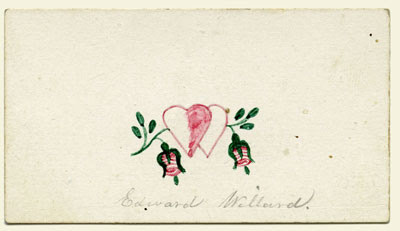 Such cards may be sent alone, or may accompany gifts. 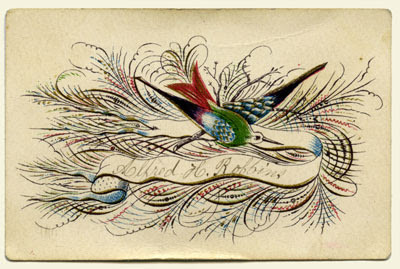 Any brief message may be penciled on a woman’s card, provided the message is sufficiently personal to partake of the nature of a social courtesy. But the card message should not be sent when courtesy requires the more explicit and respectful form of a note. In strictly formal circles a young woman, during her first year in society, pays no visits alone. She accompanies her mother or chaperon. She has no separate card, but her name is engraved, or may be written, beneath that of her mother (or chaperon) on a card employed for these joint visits. After a year or so of social experience (the period being governed by the youth or maturity of the debutante, or by the exigency of making way for a younger sister to be chaperoned), the young woman becomes an identity socially, and has her separate card, subject to the general rules for women’s cards, even though she continues to pay her most formal visits in company with her mother. During the first year after marriage cards engraved thus: “Mr. and Mrs. Henry Bell Joyce,” may be used by the couple in paying calls, or returning wedding civilities. Such cards are also used when jointly sending presents at any time. For general visiting, after the first year, husband and wife have separate cards. When one calls in person the name of the caller is given verbally to the servant who opens the door. The card is not usually sent up, except by a stranger. But sometimes there is difficulty in making the servant understand the name or properly distinguish it from some other similar name. In this case to avoid mistakes the card is sent up. If the hostess is not at home a card is left by the disappointed caller. On the occasion of a first call a card is left on the hall table, or other place provided, even though the caller has been received by the hostess. This serves as a reminder that the acquaintance has been duly and formally begun. On the occasion of subsequent calls, when the hostess is at home, no cards are employed, except, as before stated, to avert servants’ mistakes. When personal calls are not practicable, nor desirable, the leaving of cards is accepted as an equivalent. A few years ago, fashion demanded that all visiting-cards expressing or acknowledging social civilities should be left in person; the alternative in emergencies being to send them by the hand of a private messenger, never through the post-office. 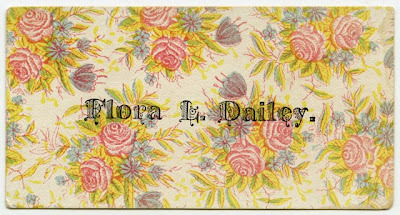 There was good excuse for this fashion in our grandmother’s day, when the post was a slow coach, or a storm-stayed postillion; but the admirable system of our postal service to-day leaves no excuse for the prejudice in favor of the private messenger; and it is not surprising that fashion has yielded to common sense in allowing that many of these cards of courtesy may, with perfect propriety, be sent by post. Alternative.–In such cases, when personal card-leaving is impossible, the card is sent by a private messenger, and an explanation, or apology, is sent by note. One of the peculiar permissions of “good form” is that which allows a man to delegate the distribution of his visiting-cards to a near female relative, whenever it becomes impracticable for him to attend to the matter personally. Only the women of his own household, or a relative with whom he habitually pays visits, can thus represent a man by proxy. In case a man is legitimately prevented, by business cares, from paying calls or leaving his cards in person, it is proper for his wife or mother or sister, or other near relative, to leave or send his card with her own. When a woman calls upon another woman she leaves her husband’s card. 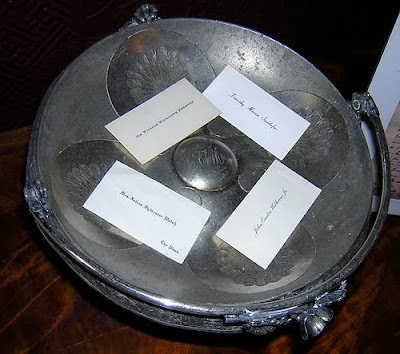 If the hostess is married, a second card is left for the host. She may leave the cards of a son, a brother, or other relative, if such responsibility rests upon her. This formality should be observed when paying the first call of the season. When a married, or elderly woman tacitly invites a man to call on her by telling him what are her “at home” days or hours, it is obligatory upon him to acknowledge the courtesy. If unable to call personally he should explain that fact and express regret, and should be particular to send a card on her next receiving day during the hours that she has mentioned. It is a special courtesy to send also a card for her husband, if he is a venerable man, or if, by reason of ill health, he is usually at home. A woman older, or busier, or occupying some position of acknowledged distinction, may send her card, indicating her receiving days and hours, to a younger or less occupied woman. This is accepted as a call, and an invitation to return the same. If the recipient chooses she may respond in person. If she does not care to establish a calling acquaintance she may respond by sending one of her own cards on the receiving day. In case opportunity occurs for explanation some polite reason may be given for not adding to one’s visiting list; but unless one has the tact to do this without snobbishness, it were better to keep silence. 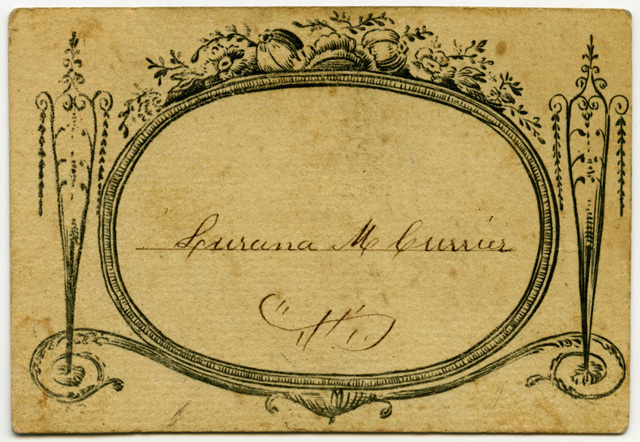 Cards of introduction are simply visiting-cards upon which the owner writes, above his own name, “Introducing Mr. —-.” The card is inclosed in an unsealed envelope, addressed to the person to whom the introduction is to be made, and with the words “Introducing Mr. —-,” written in the lower left corner. It is a delicate matter to refuse a card or letter of introduction, but it is a far more delicate matter to take the liberty to give one. If one is in doubt about the readiness of the third party to receive the person introduced it is better to find some polite excuse for declining to be the medium of the introduction. Fortunately, if the blunder is made of introducing uncongenial people they can easily drift apart again without rudeness on the part of either. When any one is invited to a church wedding and cannot attend it is proper to send, on the day of the marriage, a card or cards to those who issued the invitations; one card, if one parent, or a guardian, invites; if the invitation is sent in the names of both parents, a card for each, inclosed in an envelope and addressed to both. If the invited guest attends the wedding he leaves or sends cards within a week, similarly addressed. A personal call is allowable if intimacy warrants it. Those friends of the groom who are not acquainted with the bride’s family should merely send cards. A visiting card, with “Congratulations” written upon it, is sent to felicitate a friend upon any happy event in which friends may sympathize. Such cards are sent by messenger or by post. If a card is left in person with a kind message, nothing is written upon the card. When a man calls upon a woman while she is the guest of a family with whom he is not acquainted, he inquires for both his friend and her hostess, and, as he is a stranger in the house, he sends up a card for each (instead of announcing himself verbally, as at the house of a friend). If the hostess receives him on this occasion, but extends no further hospitality, he has no claim upon her recognition beyond the hour. If the hostess subsequently offers him any hospitality during the time his friend is her guest he must call upon her; but if he defers this until after the departure of the guest, he must leave a card for the hostess without intruding a personal call, unless he has been distinctly invited to continue the acquaintance. If the man who pays the call does not wish to continue the acquaintance with his friend’s hostess, after she has offered him hospitality, he must at least call and leave a card for her, with a polite inquiry for her health. This is obligatory; but nothing further is required. A visiting card is employed in sending informal invitations to a tea or afternoon reception. The care of the hostess is used, and in addition to the name of the regular receiving day the special date, as “January 19,” and some other specific words, as “Tea, 4 to 6,” are written in the lower left corner. (In this informal written message numbers are indicate by figures, where formal invitations require the words to be written in full.) 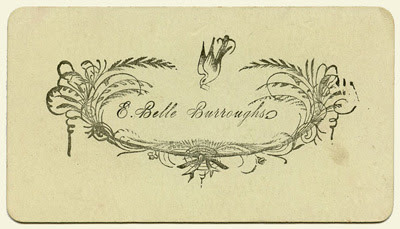 This card is accepted by the recipients as equivalent to a call paid by the sender, and they respond in person at the time indicated, leaving cards with the servant as they enter, and also, on their departure, leaving the cards of such male members of their respective families as have been invited, but are unable to attend. As few men can leave business at this hour these occasions become prominent illustrations of “proxy” card-leaving. If any one invited cannot be present (and in case of a man no female relative is there authorized to represent him) a card must be sent by post or messenger on the receiving day. It is customary for the younger society men to pay a round of calls after returning from the usual summer “outing,” or to leave cards in lieu of a call. 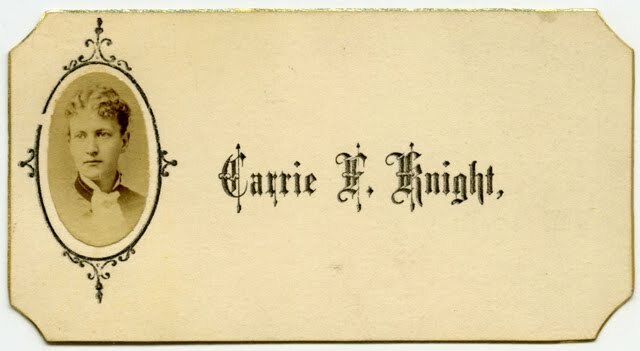 When leaving for a long absence, or when parting from transient, but agreeable acquaintances, as companion tourists, etc., when time does not admit of farewell calls, visiting-cards are sent by post with “P. p. c.” (Pour prendrè congé–to take leave) written upon them. This is equivalent to saying, “If ever we meet again we will meet on the footing of friends, not strangers.” It is a pleasant way of showing appreciation of the pleasure afforded by another’s society, and the formality should not be neglected by one who would be esteemed thoughtfully polite and kind.